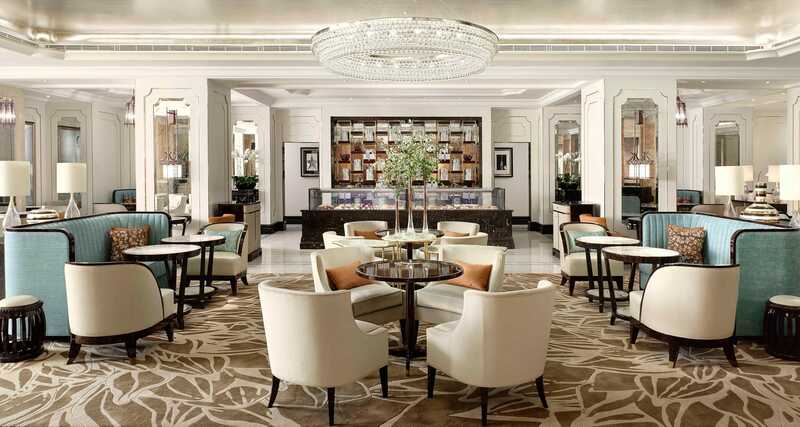 The new Palm Court is a light, fresh and elegant space that serves as a dramatic backdrop to the existing Lobby space. 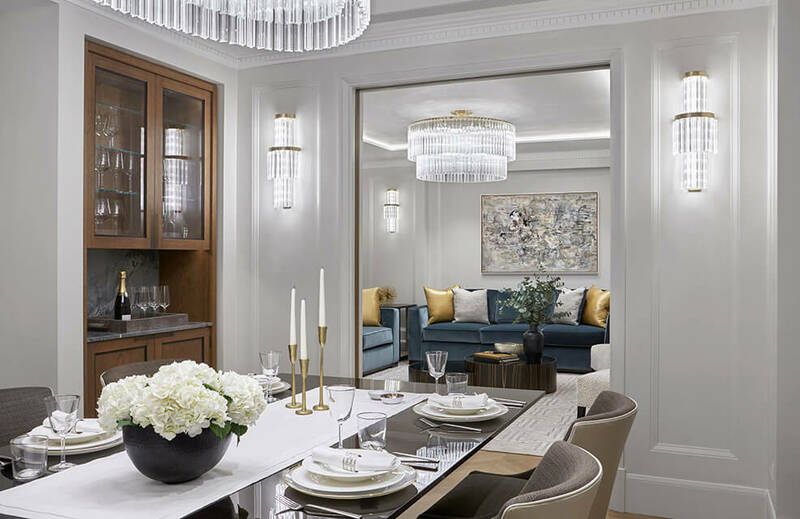 Traditional, luxurious finishes such as Natural stone have been used throughout the floors together with antiqued mirror and painted timber panelled columns to create a lighter feeling overall. 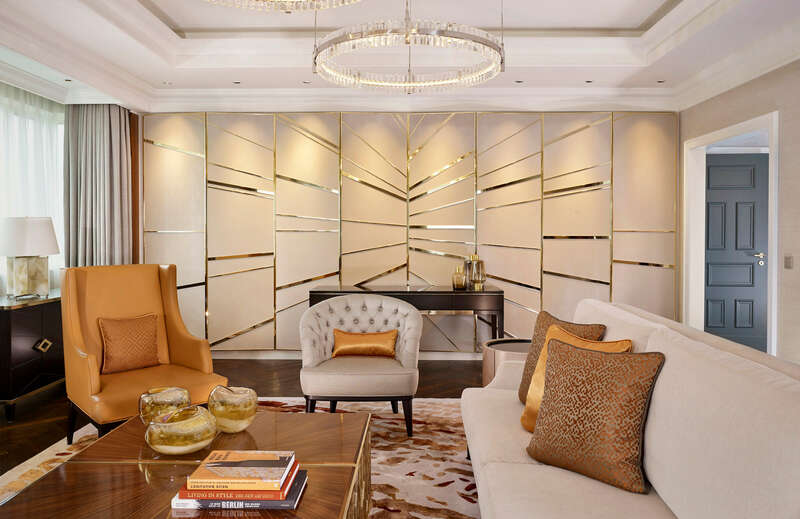 A sense of volume and drama has been created using back lit silver leaf coffers to the ceilings whilst structure has been added with the use of fixed central banquettes. In order to give the room further flexibility, the central banquettes are surrounded by looser seating groups making it a perfect venue for both larger groups and more intimate occasions. Focusing on decadent afternoon teas during the day and lighter bites in the evening, the Palm Court has a wealth of character and distinction and the space is richly layered with a multitude of varying finishes that create a luxurious and opulent feel yet maintain a light, fresh and open ambience that provides a flexible ambience that works well at any time of the day. Tucked away within the Lobby space, the new bar forms a natural extension of the Palm Court. The counter has been maintained in its present podium position and therefore forms the focus of this space. The new horseshoe shape allows for both a more communal seating arrangement and also provides a ‘stage’ on which the bar tenders may entertain whilst creating exotic cocktail combinations. Seating booths sit to either side of the bar and allow for extra guests to share in the theatre created. Subdivided by a striking double sided fireplace the Bar flows easily into and out of the Palm Court with the fireplace offering both focus and backdrop to both spaces whilst maintaining transparency between the two. Guests are greeted with a light, refined scheme with a fresh palette and contemporary artwork that reference the Langham heritage and Hong Kong’s vibrant fashion district. Intricately detailed decorative panels combine the palette of soft greys, golds and pink and the addition of sliding shutters to the bathroom open up the space and allow natural light in. In the bathrooms updated stone finishes add freshness and are another nod to the art deco period. 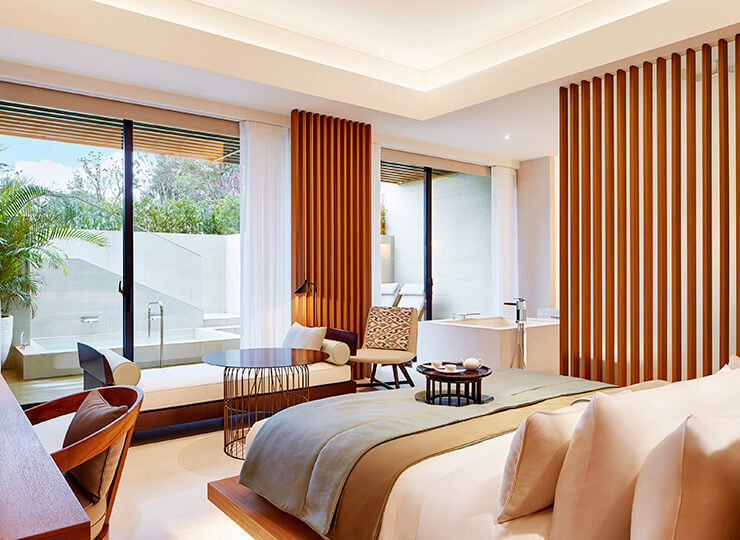 Located a short distance from Hong Kong Film Industry’s ‘Avenue of the Stars’, the Director’s Suite links the era of Silent Movie with the fast paced action of modern Chinese cinema. Golden Age of Film – high gloss, Nickel, Lucite and Glass. Imagery reflects drama and theatrical themes from myths and legends to modern day romance. The Director Suite features strongly designed living spaces with playful character pieces alongside deep sofas for lying back and enjoying a film on the oversized screen. The bedroom reflects romance and opulence with soft pooling drapery, pleated and buttoned upholstery with cut glass and mirror for glamour. Full size photographic art from film shoots gives the final touch in addition to an extensive library of films and film memorabilia.